Drop leaf tables are a great way to get the room you need when you need it, and the table space when you need that. Do you live in a small apartment or home? Do you constantly feel like you don’t have enough room to move around, or that your table is too small to have any guests over? Would you like to correct this? Then shopping for drop leaf tables may be the way to get around it. Drop leaf tables are a great way to get the room you need when you need it, and the table space when you need that. Here are a few reasons they work so well. -Drop leaf tables are adjustable. When you fold the leaves of some drop leaf tables down you end up with a small table, but for some tables you end up with a piece of furniture just a few inches wide, perfect for pushing against the wall, completely out of the way, when not in use. Depending on the size of your eating arrangements, one or the other may work better for you. 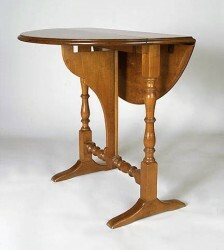 -Drop leaf tables can be found both simply built or expensively ornamented. The tables were originally ornamental decorations, so why not get a table like that today? You can find them in expensive woods like oak or mahogany, or you can get them inexpensively built out of pine. Depending on your circumstances, tastes, and budgets, one of these probably works for you better. -The tables are widely available, both online and in furniture stores, so you should be able to shop through different drop leaf table and chairs sets immediately. Furniture store owners could point out other sources for you if you don’t like what they have to offer. You could also get them from stores like IKEA, either online or in person. There are many reasons why drop leaf tables work so well for smaller apartments, so why not indulge yourself? Start looking for a new table today! NextWhat Exactly Are Solar Garden Lights?